The fairy tale setting of this home is special; nestled on more than 1½ acres with no neighbors in site and surrounded by nature, yet on a quite country road with many higher priced homes nearby and less than 4 minutes from Route 81. 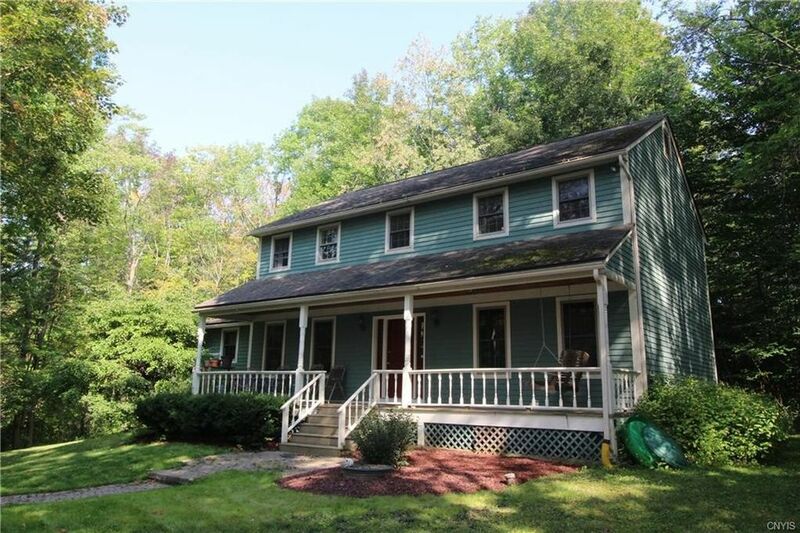 This expansive 2300 square foot colonial with cedar siding and a huge front porch that beckons you to sit on the swing and enjoy the peace and tranquility, has many amenities. Features include modern kitchen with granite counter tops, walk-in pantry, vaulted ceiling with skylights, master bedroom and bath, natural woodwork, solid wood doors, formal dining room, first floor bedroom, 2.5 baths, family room, hardwood floors, wood burning stove, finished basement and high speed access. Priced $30,000 below Town assessment report of Full Market Value!!! Directions: From village of Lafayette take route 11 South to North Road to Right on Sugarbush. Home is on the Left.